An exception is an error that happens during the execution of a program. It is important to have exception handler in KnitLib to handle and deal with errors automatically. Many standard libraries define their own exceptions to report errors that may occur in functions they define. Depending on the kind of error in knitlib (“communication error”, “pattern not found error”, etc.. ). The exception handler module in the knitlib can handle the exception and the knitlib can be continued afterwards with the previously saved data. Exception can be defined as classes which do any other class can do, but are usually kept simple, often only offering a number of attributes that allow information about the error to be extracted by handlers for the exception. 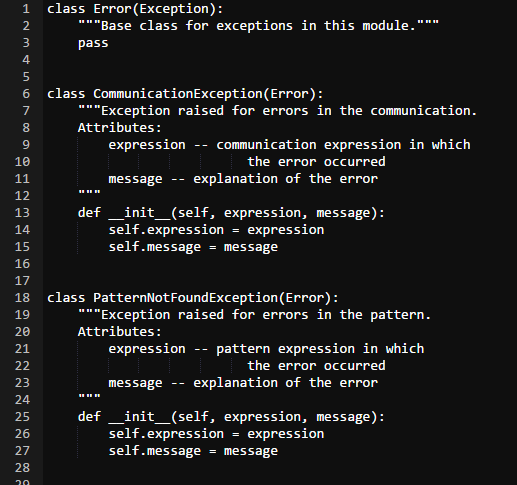 When creating a library like KnitLib which can raise several distinct errors, a common practice is to create a base class for exceptions and subclass that to create specific exception classes for different error conditions.